On Tuesday, May 15, Midnight Circus in the Parks officially kicked off the 2018 season with our community partners. Immediately afterwards, Amy Ewaldt, President of the Maplewood and Lucy Flower Park Advisory Council (MLFPAC), invited Midnight Circus Development Director, Julie Dickinson and Maria Stone, Community Relations Manager for the Chicago Park District, to take a walking tour of her community. The walking tour started in front of Cortland Preschool founded by Amy in 2009. Cortland Preschool has a strong connection to the community and environment. The students cultivate the parkway next to the school from planting and maintaining to collecting seeds from those plants. Here’s what the parkway looked like before Amy and her small, but mighty preschoolers dug in. They have even expanded to help a neighbor. While showing the neighbor’s space, Amy noticed monarch caterpillars in the milkweed plants and was excited to be able to show the kids after the walk. Julie particularly loved the stick sculpture that invites kids and neighbors to participate and weave in sticks to an ever-changing piece of art and was inspired to start one in front of her house. Amy has a way of inspiring those around her. Next stop was Lucy Flower Park a couple blocks away. Amy showed pictures of what the park had been before she and the community got involved in working with the park district to transform this small pocket park. The result is a public space that neighbors flock to. The park was bustling with people in the sandbox, exploring the community garden space and climbing on the playground equipment. The next stop was Maplewood Park. Maplewood Park has one of the smallest functioning fieldhouses in the Chicago Park system. On their website, MLFPAC states that the fieldhouse, built in the 1950’s, is 600 square feet. Amy and the Advisory Council worked with the Chicago Park District to envision a new fieldhouse and were given the goal of raising $100,000 from the community to make this new field house a reality. Amy was excited to show that the banner hung on the Lucy Flower fence was out of date. They only have a little over $25,000 left to raise. Being a partnering park for the Midnight Circus in the Parks tour is one way Amy plans to get to that $100,000. In the dozen years since Midnight Circus has existed, the Circus has helped community organizations raise close to $1,000,000 for park improvements and programming. Want to help Maplewood realize their dream of a new fieldhouse? You can buy an ad in the circus program book seen by over 13,000 attendees. Be sure to specify the park when you check out. Come see the show at Holstein Park September 14-16. Concession sales will go to Maplewood, Holstein and Haas Parks that weekend. If you can’t make it to Holstein Park, your tickets still help Maplewood get their new fieldhouse. Ticket sales are pooled and at the end of the season, partnering parks get a percentage of the combined tickets sales. You can also buy a personalized brick to be incorporated into the new exterior hardscape at Maplewood, compete in MLFPAC's first-ever SPIKEBALL Tournament on September 29th or just donate directly. Volunteers like Amy Ewaldt are why we here at Midnight Circus love what we do. Working with volunteers make the impact of our weekend of two-hour performances last well beyond when the iconic blue and purple tent comes down. Joyce Chapman was born in Japan to an African American dad and Japanese mother. Her father, a soldier with the Army, met her mother while stationed in Japan. Joyce’s early years were that of a typically ‘Army brat’ living in various places throughout the world. In June of 1968 when Joyce was twelve, her parents settled in the Pullman neighborhood of Chicago. Pullman was a bit of a shock to Joyce and her brother. They had never lived in a solely black community before. Asiaha Butler (pronounce Ay-Sha) has a positive energy that’s infectious. She saw a problem in her community of Englewood and wanted to make a difference. She didn’t know where to start, at first, but that didn’t stop her. Until recently, she was working downtown at the Institute of Real Estate Management, an association for property managers, as the supervisor for Education Services. Anyone who meets Asiaha knows she’s a natural leader. Plus, from her years in the business, she understood real estate and development. Butler felt she had the capacity to make an impact, the question was how. The park had an amazing neighborhood advocate, Tom Cunningham, who basically served as a one-man advisory council. He pushed for the new playground that was installed ten years ago and the new roof on the field house. When Tom passed, I felt compelled to get involved to help continue his work. Midnight  Circus in the Parks was founded on the belief that community involvement is the foundation on which to build long‐term success with positive effects lasting well beyond a two‐hour performance. To that end, all performances are affordable, accessible, and provide a platform for community groups to volunteer, fund raise and become active arts participants. 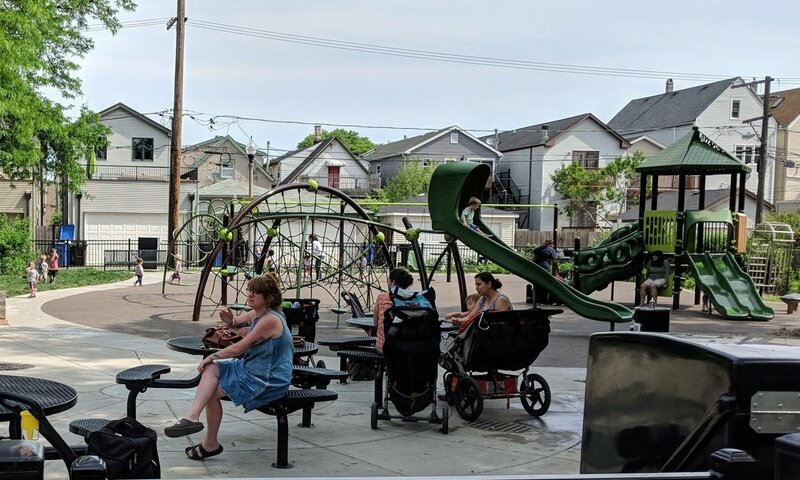 Along with the wonderful Park Advisory Councils (PACs) at each park,  Midnight  Circus in the Parks seeks out extraordinary community organizations to collaborate with in the neighborhoods we play. It all started at a Welles Park Advisory Council meeting about eleven years ago. Jeff and Julie Jenkins walked in with a video of Midnight Circus and an idea to help the park raise the money to redo our terribly run down play lot. The second I saw the video, I knew, if we built it, they would come. We had just organized our Easter Egg Extravaganza with pizza, an art project and Easter bunny raising $6,000. The community was ready.